WebToffee Subscription for WooCommerce allows you to create subscription products and manage subscriptions facilitating a flawless subscription-based e-commerce business enterprise model for your store. Go to: WooCommerce > WebToffee Subscriptions. Click the Add Subscription button. Add a customer to the subscription. Refer Add a Customer section for detailed steps. Add a billing schedule. Refer Add a Billing Schedule section for more info. Set the subscription status, as per the process detailed in the Set Subscription Status section below. Create a pending renewal order from the Subscription Action meta box as explained in the Create pending renewal order section. Click the Customer select box under the subscription details meta box. Type the first few letters of the name or email for the customer. Once a set of accounts is loaded, click the customer. Once a subscriber is added, enter the billing and shipping addresses to be used to manage recurring payments and shipments for the subscription. 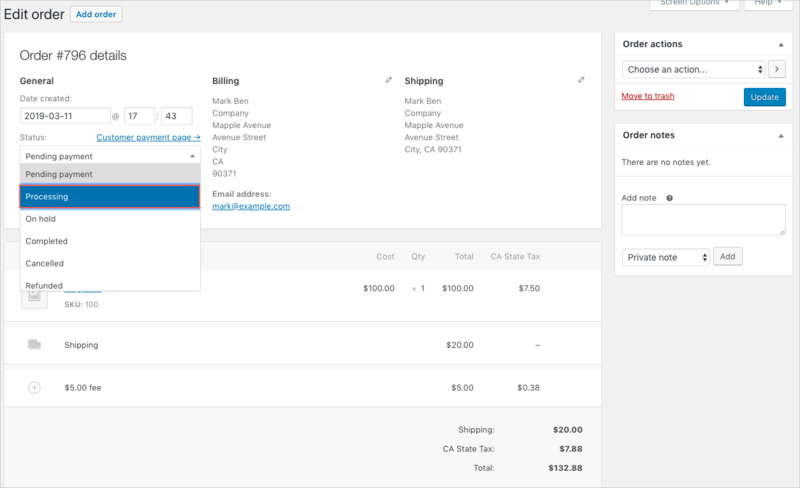 Existing addresses on the customer’s account can automatically be loaded into Billing Details or Shipping Details of the Subscription details meta box. Click the pencil icon next to Billing Details. Click the pencil icon next to Shipping Details to Load Shipping Details or Copy Billing Details. You can also add or edit these addresses, if necessary. Recurring interval and period on which renewal orders are generated to capture recurring payments and manage the shipping of items. 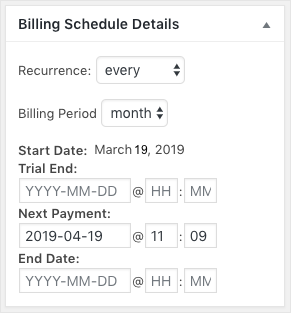 Click the Recurrence section of the Billing Schedule meta box to set the billing interval for the subscription. By default, this is set to every, which means once per day, week, month or year, a renewal order is generated. Next select the billing period for the subscription, which can be day, week, month or year. Click the Start Date and enter a date or use the calendar to choose a date. The start date must be in the past. Click the Trial End Date, and enter a date or use the calendar to choose a date (optional). Use the Next Payment Date to edit the next recurrence of an existing subscription. Subsequent recurrences will be based on this date and the recurrence interval. e.g if you set the next payment date to 11th April 2019 the subsequent run will be on 11th May 2019 considering the monthly billing period and recurrence. Click the End Date text box, and enter a date or use the calendar to choose a date to set an expiry for the subscription. Leave it empty for a lifetime subscription. Click the Add item(s) button in the Subscription Items meta box. Click the Add product(s) button. Type the first few letters of the product’s name until matching products are populated. Click the name of the product you wish to add when it loads. Repeat steps 4-6 if you wish to add more products (optional). Click Add. The chosen product(s) is/are displayed as items in the Subscription Items meta box. Click the Add fee button. Click in the text box displaying the placeholder: Enter a fixed amount or percentage to apply as a fee and enter the amount you want to charge customers as a fee on each renewal. Click the Add shipping button. A generic Shipping item will be displayed in the Subscription Items meta box. Click the pencil icon next to the shipping line item. Click in the text box displaying the placeholder: Shipping. 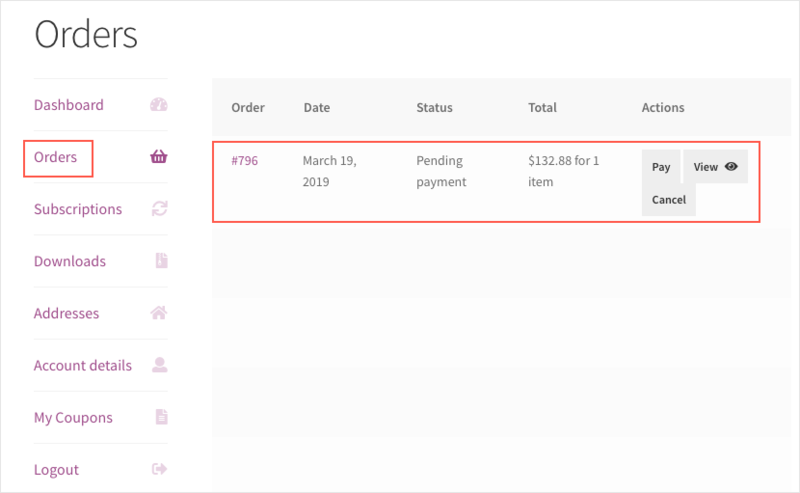 Enter a label for the shipping item to display to customers viewing the subscription and associated orders. Click the select box below the Shipping text box. Select a Shipping Method from the drop-down and enter the amount you want to charge customers for shipping on each renewal. Click the Add Tax button in the Subscription Items meta box. Click the radio button next to the tax rate you wish to add. Repeat for each tax rate you want to be applied to the subscription. 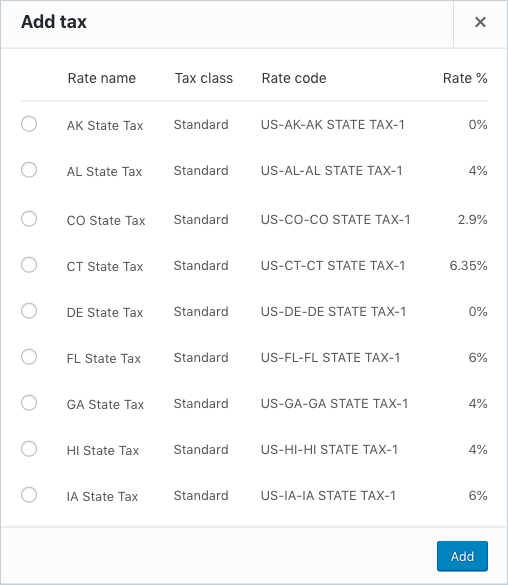 Note: Before adding a tax rate to the subscription, you need to set up tax rates in WooCommerce>Settings (Tax)tab. Now that we have set up all the quintessential details of a subscription. What remains is to create an order to record the transaction so that it reaches the customer. This will be done by creating a pending renewal order. Let us create a pending renewal order against this subscription. 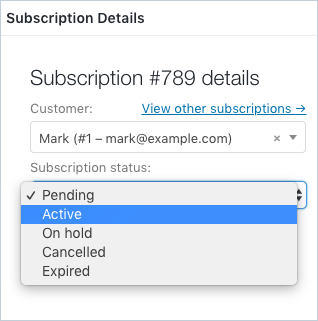 From the Subscriptions Actions meta box, select Create Pending Renewal Order. Now that we have an order corresponding to a subscription, the next step is to activate the subscription. This can be done either manually or automated following a payment by the respective customer. We will go through both the approaches below. subsequent payments will be triggered as per the scheduled recurrence in automatic repayment mode, using the same payment method and the next payment date will be filled up under Billing schedule. Alternatively, the store owner can update the order status to Processing/Completed upon receiving the payment manually. This can be done by changing the order status to Processing in the order status meta box as indicated below, from the order detail page. This triggers the below actions. the subsequent payments will be triggered as per the scheduled recurrence in automatic repayment mode, using the same payment method and the next payment date will be filled up under Billing schedule. We can also edit an existing subscription but there is a limitation on what aspects can be edited. It is also important to note that any such changes will reflect only in the upcoming recurrences. Note: Additionally there could also be limitations w.r.t the respective payment gateway providers for edits related to billing schedule and recurring totals. Change the billing schedule constitutes the subscription’s end date, next payment date, trial end date or recurring schedule. Go to WooCommerce > Webtoffee Subscriptions. Click the Subscription ID which redirects you to the Edit Subscription screen. Modify subscription’s end date, next payment date, trial end date or recurring schedule, as required. If you need instructions for this process, see the section on how to Add Billing Schedule. Go to WooCommerce >Webtoffee Subscriptions. Recalculate the total amount by clicking on it. Click the Subscription Status select box in the Subscription details meta box. Click the status you want to give the subscription. This entry was posted in Documentation, Knowledge Base, Subscriptions, Subscriptions for WooCommerce, WooCommerce. Bookmark the permalink.